Climate change could disrupt plants' dispersal of seeds. Global warming is causing some plants to flower early, while others can now survive the winter. Scientists have found that climate change may even threaten the dissemination of plants. Noelle Beckman, post-doctoral fellow at the National Socio-Environmental Synthesis Center, says healthy seed dispersal is crucial for the survival of plant species. … but rising temperatures and changing weather patterns associated with global warming are likely to disrupt this process. 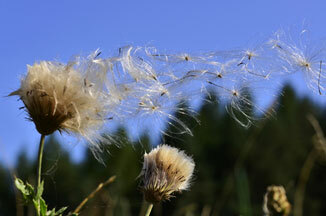 For instance, shifting winds could cause seeds to land in areas with improper growing conditions. Or with no wind at all, seeds could remain too close together, causing plants to compete for nutrients. Over time, these changes could alter the way plants are distributed with unknown consequences for plant species and the other life that depends on them. Disclosure: Noelle Beckman’s research is supported by funding from SESYNC, where Lisa Palmer is also a fellow.